Click on the link below to view a video or photos of this event. (Please note, you may be directed to the Archdiocese of Winnipeg website). On Thursday, August 30th 2018, the Archdiocese celebrated the Ordination of six men to the Ministry of Deacon. These men have been in formation for this ministry of service since 2014. They come from a variety of parishes within the archdiocese and once ordained, will serve in their parish as well as carry out additional ministries within the greater archdiocese. Among those to be Ordained is our own parishioner, Gilles Lorteau. 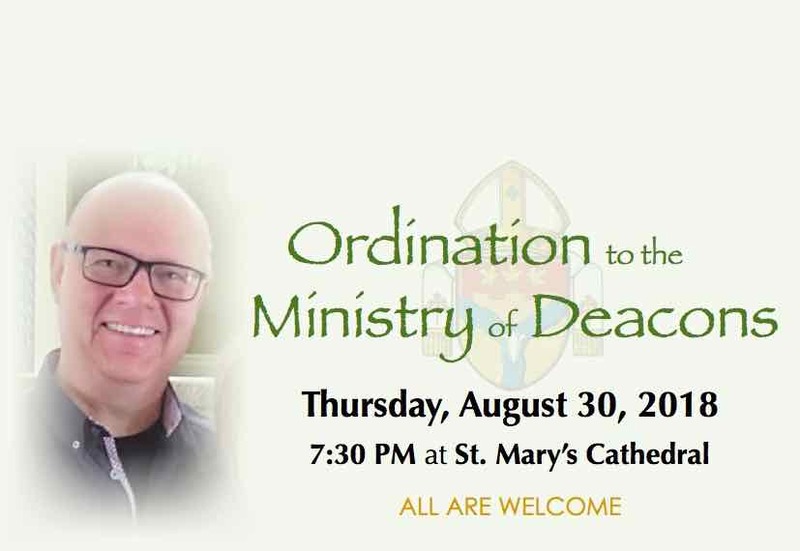 All are invited to attend the ordination which will take place at 7:30 p.m. in St. Mary’s Cathedral.